You don't have to look far at the bakery to notice sesame seeds. These seeds provide visual appeal and a little extra nutrition to baked goods such as rolls, multi-grain bread and bagels. Buying bulk sesame seeds at the supermarket, however, gives you the freedom to add these tiny white or black seeds to stir-fry and vegetable dishes. One tablespoon of sesame seeds has 52 calories, 4.5 grams of fat and 2.1 grams of carbohydrates, according to the U.S. Department of Agriculture. Sesame seeds are notably high in calcium, with 88 milligrams of calcium per tablespoon. It's also possible to enjoy sesame seeds in the form of tahini, which is a butter-like paste made from the seeds. One tablespoon of tahini, notes the USDA, has 89 calories, 8.1 grams of fat, 3.2 grams of carbs and 64 milligrams of calcium. 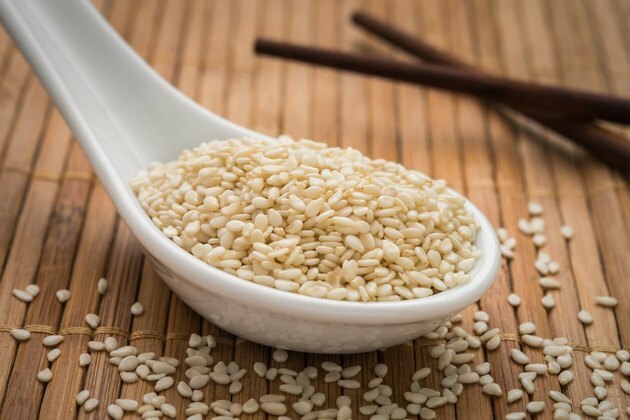 Should You Avoid Sesame Seeds While Pregnant?